March 3 is World Hearing Day – Check Your Hearing! World Hearing Day is an annual campaign by Office of Prevention of Blindness and Deafness of the World Health Organization (WHO). The campaign’s objective is to share information and promote actions towards the prevention of hearing loss and improved hearing care. Each year, WHO selects a theme, develops educational materials, and makes these freely available in several languages. It also coordinates and reports on events around the globe. 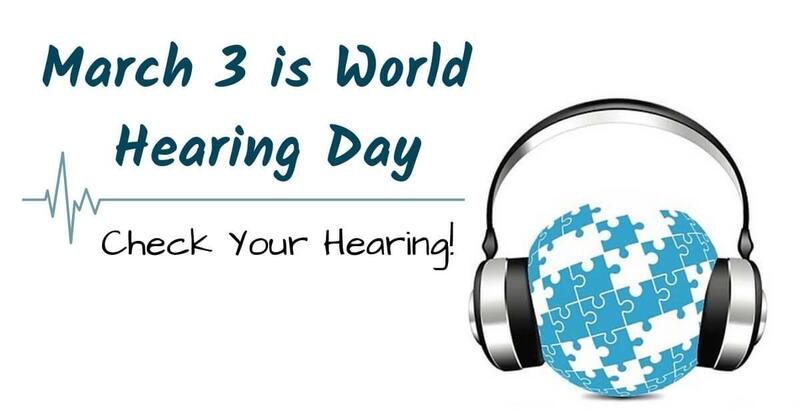 Activities take place across the globe and an event at WHO’s headquarter in Geneva is held each year – this year, World Hearing Day is observed on March 3rd. For 2019, World Hearing Day’s theme is “Check Your Hearing. Data from researchers worldwide indicate that a significant part of the burden associated with hearing loss comes from unaddressed hearing difficulties. A study conducted in the United Kingdom indicate that only 20% of those who have a hearing problem seek treatment. A study performed in South Africa reported that individuals who experience hearing difficulties wait between 5 and 16 years to seek diagnosis and treatment. The longer an individual waits to seek treatment for hearing loss, the worse their symptoms can become. Treating hearing loss has been linked to emotional well-being, stronger relationships, higher earning power and fighting the onset of dementia. World Hearing Day is a call for people around the globe to educate themselves and loved ones about hearing loss and encourages people to get tested and treated. Although not all hearing loss can be prevented, we can take action to take better care of our ears, such as wearing ear protection when working with loud machinery. Once hearing damage occurs it often cannot be reversed. Hearing loss can be a slow process, so it can be difficult to read the signs of deterioration. When you know the signs of hearing loss, you are better prepared take yourself or a loved one to get your hearing checked. Medical professionals urge you to address the symptoms of hearing loss. If you suffer from any of the warning signs of hearing loss, it is advised you begin with a professional hearing assessment to eliminate guesswork. Untreated hearing loss can cause serious long-term conditions, especially later in life. The longer you put off getting hearing loss treated, the worse symptoms can get. Hearing loss has a number of side effects. Untreated, hearing loss can cause people to withdraw from socializing and lead to feelings of isolation and depression. Several studies have concluded that hearing loss contributes to the early onset of dementia. According to the WHO, approximately one third of people over 65 years of age are affected by disabling hearing loss and are potentially at risk of affecting their overall health if untreated. Hearing aids can help people regain lost hearing and help them participate in life to it’s fullest. Just by reading this to educate yourself, you are taking an important step. If you have concerns about your hearing, or have someone in your life that shows signs of hearing loss, make an appointment. Hearing tests are easy and painless. Once you know the results of your hearing test you can get treatment or rest assuredly that your hearing is fine and you have nothing to worry about. Don’t delay and contact Beverly Hill Hearing Center to schedule a hearing test today!